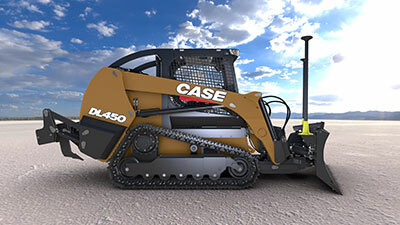 Case Construction Equipment introduced its new DL450 compact dozer loader and a new line of mini excavators. The DL450 compact dozer loader combines the characteristics of a compact track loader (CTL) with a crawler dozer. 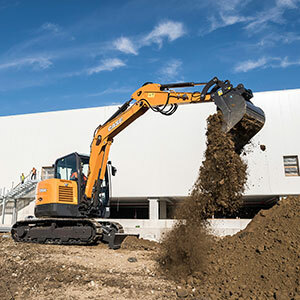 The core feature of the DL450 is a C-Frame dozer interface that pins directly into the chassis of the machine, providing the stability and smooth operating plane of a CTL, and ensures that all operating power and stresses are channeled through the machine’s chassis and not its loader arms, the company said. The cab and controls inside of the machine will feel familiar both to operators of CTLs/skid steers and dozers. Similar to ISO controls, forward and reverse travel, and steering is controlled with the left hand on this machine, while boom and bucket controls are manipulated with the right. Those same controls in the right hand control the lift, angle and tilt of the 6-way blade. A launch date for the machine has not been confirmed. The additions to Case Construction’s lineup of mini excavators include the CX17C, CX26C, CX33C, CX37C, CX57C and CX60C. The new machines feature a zero tail swing, short-radius or conventional design, adjustable boom offset for improved maneuverability and an auto-shift travel system for operator convenience. Additionally, an auxiliary hydraulic system with standard proportional controls, shut-off valve and easy-to-select joystick control patterns offer increased productivity. • CX60C: 64.7 horsepower; 12,940 pounds; bucket digging force: 9,190 foot pounds.